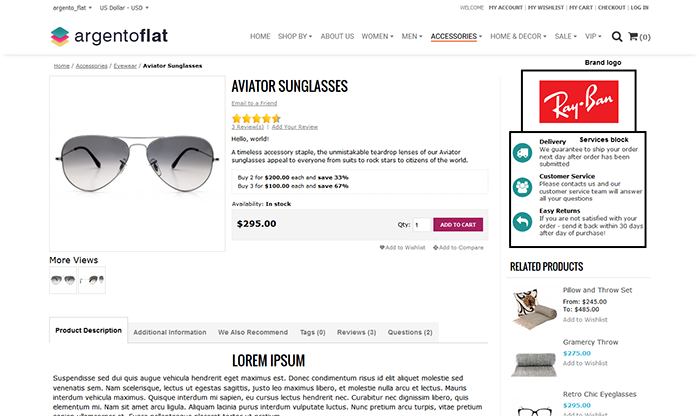 Argento use Attributepage module to show the brand logo. So, first you need to setup the Attributepage extension. Navigate to TemplateMasters > Attribute Pages > Manage Pages and create brands page based on manufacturer attribute. Feel free to use any other attribute. Attach image and thumbnail images to each of the attributepage options. Open Cms > Static Blocks and open product_sidebar block. Change manufacturer to attribute code, that you are using for saved attributepage. Navigate to Cms > Static Blocks and find services_sidebar block. Please note, that this block is displayed on the Contacts Us page too. If you would like to chnage the block on the product page only, please edit the product_sidebar cms block.